THE ROAD SAFETY Authority (RSA) has told those living in Ireland who have a UK drivers licence to swap it for an Irish licence sooner rather than later. As the Brexit deadline approaches, so does the prospect of a no-deal. 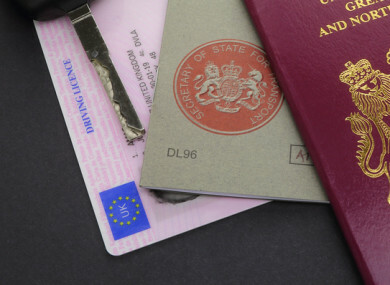 The authority said that in the event of a no-deal Brexit the driving licence of a UK licence holder living in Ireland will no longer be recognised and the driver will not be able to continue driving on that licence. Fianna Fáil transport spokesman Robert Troy said RSA confirmed to him a demand of up to 500 applications per day was being seen in relation to the number of people applying to switch their UK licence to an Irish one. “In the event that the United Kingdom leaves the European Union without an agreement in place, the driving license of a UK licence holder living here in Ireland will not be recognised and the driver will not be able to continue to drive in Ireland on that licence,” chief executive Moyagh Murdock states in a letter to Troy. The RSA confirmed to TheJournal.ie that the numbers are up, but they are making a lot of process and working its way through the applications. A spokesperson for the RSA sid that in 2018, 6,500 people swapped for an Irish licence. So far this year, 11,000 licences were physically produced. As of yesterday, the RSA said it is working on producing 4,000 licences at the moment. About 500 applications are being received each day. They added that about 600 applications were processed yesterday alone. The spokesperson said that those with a UK licence need to swap it over as soon as possible, as it will be invalid in a no-deal scenario. If there is a deal, there is nothing to worry about, they added. “It is better to be safe than sorry. Get your application in now and we’ll swap it over,” they said. The RSA said that anyone living in Ireland for longer than a year are meant to surrender their UK licence and get an Irish licence, however they said that many people have not done this. In order to tackle the high number of applications, the Licence Exchange section of the National Driver Licence Service (NDLS) has had its operation increased six-fold since 11 March. Murdoch said that 20 RSA staff have been assigned to licence exchange, as well as 11 Abtran staff to assist in the processing of UK licensing applications. As of 12 March, waiting times for the swapping of licences were down to 7.5 days. The RSA told TheJournal.ie that they are “ploughing through” the applications, with licence exchanges being prioritised. The spokesperson concluded by appealing to those with UK licences to “be prudent” and get their applications in. Email “RSA tells those living in Ireland with a UK drivers licence: 'Better to be safe than sorry, swap your licence now'”. Feedback on “RSA tells those living in Ireland with a UK drivers licence: 'Better to be safe than sorry, swap your licence now'”.